Lab equipment is essential for home-brewing. You need a soldering iron to build electronics, a power supply to provide energy to your circuit, and measurement equipment to test/verify its behaviour. This page lists the most important parts of my lab. Most of the gear is getting a bit older nowadays. 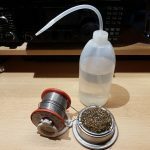 So sometimes I look around to find some replacement gear, but in the end I think by myself: why should I buy new equipment while I’m still happy with the old stuff? 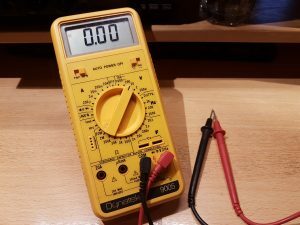 My Dynatek 9005 multimeter, almost 25 years old now. I own some multimeters, but my absolute favourite one is this Dynatek 9005. I got this one in 1993, it was the last present I got from my father before he passed away later that year. It also was my first serious measuring device, and because of that I selected this model. 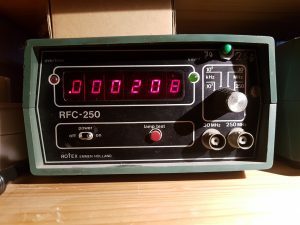 Apart from the basic stuff it measures frequency, duty cycle, capacity and transistors. These extra capabilities where very useful to me at that time, since I could only dream of an oscilloscope. Nowadays it is still my primary multimeter, including the original probes. Dynatek is a dutch company and still manufactures measurement equipment nowadays. This model is not available any more, however its successors are. During my electronics study I learned that soldering isn’t that easy, unless you use a quality soldering station. That was the reason I bought this Weller WTCP-S. This soldering station is well-known for its quality. It’s a solid machine, it has seen the floor so many times and still rocks. Ok, the iron holder can’t be attached to the console any more, but who cares? In 1994 I paid a huge amount of money (for a student) for this device. It is based on Weller’s Magnastat technology, which means that the operating temperature is regulated by the tip. 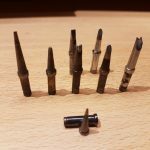 I normally use a 2.4 mm #7 screwdriver tip, but I own some other tips as well depending on what’s to be soldered. Tips are still available, although they switched to a new type so I had to buy an adapter. 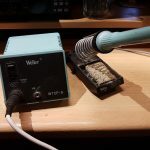 Weller is still one of the main brands when it comes to soldering. The company was founded in 1945 and is nowadays owned by APEX Tool Group. My rock solid 1994 Weller WTCP-S soldering station. My collection of Magnastat tips, including the new style tip with no. #7 adapter at the bottom. Some accessories I use when soldering. I prefer 1 mm Multicore 60/40 solder for most work, sometimes I apply 0.7 mm for small stuff like SMD parts, or for precision work. During my first job in 1996 (test engineer at a pacemaker factory) I met a colleague who was a radio amateur too. He was not practising any more, so he offered me some boxes filled with parts and equipment, including this nice counter. It is from the late 70’s but still going strong. Inside I found a modification which happened to be a crystal oven. Although I own several counters nowadays, this Rotex is still my favourite one. A few years ago I had the opportunity to verify its accuracy, it successfully passed the test: its reference frequency is spot-on! Rotex is a dutch company, founded in 1967. After just a few years they quit producing electronics measurement tools, and focused on manufacturing fluid control systems, pneumatic actuators, valve automation systems and control components. They changed their name, however Rotex is still one of their brands. During one of the dutch hamfests in 2016 I found this old generator. I simply had to buy it, since it perfectly matches my counter. Once home, I immediately put it to the test and it still worked great! It has a built-in counter, using five tiny 7-segment LED displays, each provided with a small fisheye. The generator goes up to over 1 MHz and produces sine, block and triangle waves. It lacks duty cycle settings or modulation, but I don’t miss these features that much. The Rotex generator has never been as popular as its counter, so probably few exist nowadays. I prefer this counter above my other one, which is a Heathkit IG-1271. 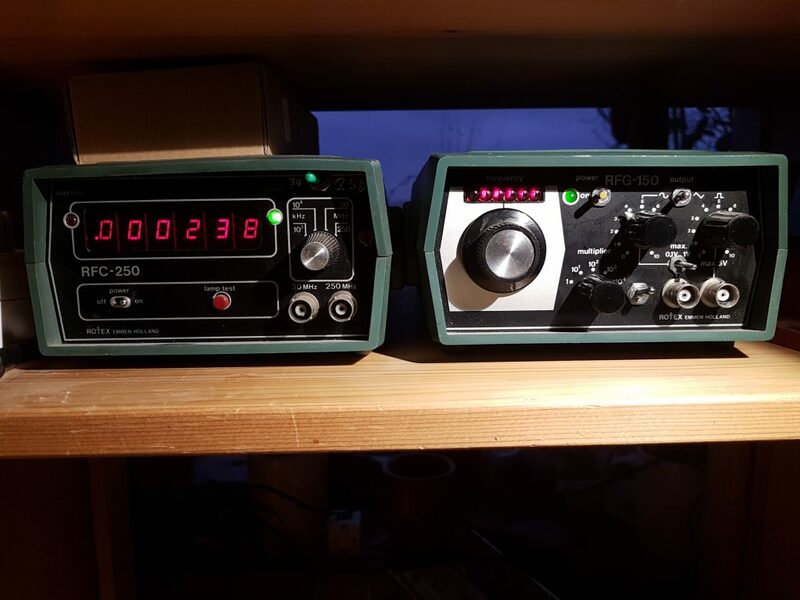 Rotex RFG-150 function generator, next to its brother. For lab purposes I used the power supply’s of my radio’s, although this is not preferable. So after summer holidays in 2018 I decided to buy a real lab power supply. I examined my bank accound, did some market research, and decided to buy the Siglent SPD3303C. It’s nicely priced and provides enough features for my lab. It has a fixed 5V 3A output for logic stuff (e.g. Arduino experiments) and two adjustable outputs (0-30V, 3A each). Outputs can be switched on and off individually. Both adjustable outputs can be combined too, both series and parallel. Now my lab finally has a power supply with current limitation! Siglent is a rather young company, founded in 2002 in Shenzhen, China’s electronics manufacturing hub. They focus on electronics lab gear, including power supply’s, oscilloscopes, waveform generators and spectrum analysers.